Working on the road requires a great deal of mobility. In years past, sales personnel had to rely on their staff inside the office to gather the information they needed while out on the road. This created the need for many phone calls, incredible organization and the reliance on a large number of people. It also created a great deal of inefficiencies and inaccuracies for businesses of all sizes. One small mistake by a salesperson or staff member and the entire system could suffer. Customer satisfaction waivered and the job of the salesperson was made difficult. Today, there is a solution to end the inefficiencies, inaccuracies and lack in productivity. 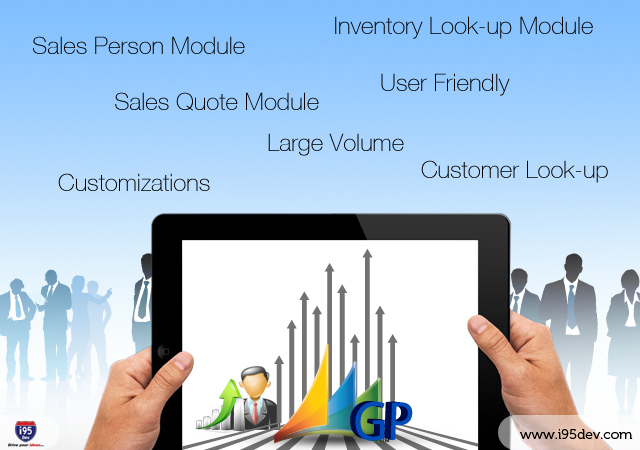 Microsoft Dynamics GP Mobile Sales Solution offers sales personnel everything they need at the touch of their fingers. There is no need for pen and paper and back and forth phone calls between your staff and your customers. With the touch of a few buttons, you can have all the answers to your questions, including customer information, sales information, inventory levels and pricing. It can all be right there with you on your iPhone, iPad or Android or any other tablets, wherever you go. The Microsoft Dynamics GP Mobile Sales Solution is feature-rich, enabling sales personnel to realize greater customer satisfaction, higher productivity and less reliance on anyone else. All systems are updated in real-time to ensure you always have the latest information. The Microsoft Dynamics GP Mobile Sales Solution is the wave of the future. It gives sales personnel an entirely new way to do their job with greater efficiency and productivity. It can reduce many headaches and problems salespeople and businesses currently suffer, simply by having your information at the tip of your fingers.